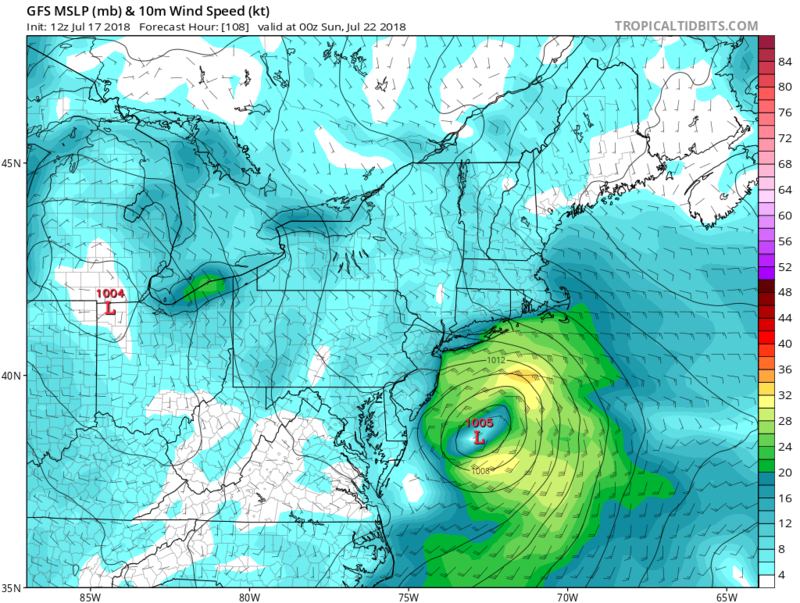 12z GFS run, has a definite closed clow, but is it a TS? The pressure is just enough to be a low end TS verbatim, but as sroc said probably will become cold core, still def interesting. Makes a hook right into NYC. At that time stamp I will be finishing up seeing Jeff Dunham at Mohegan Sun in CT (which a apocalyse could be going on outside and you wouldn't know it), I am therefore hoping if anything good happens its later into Sunday or Monday. NYC had major flooding and a funnel cloud that did not touch down. 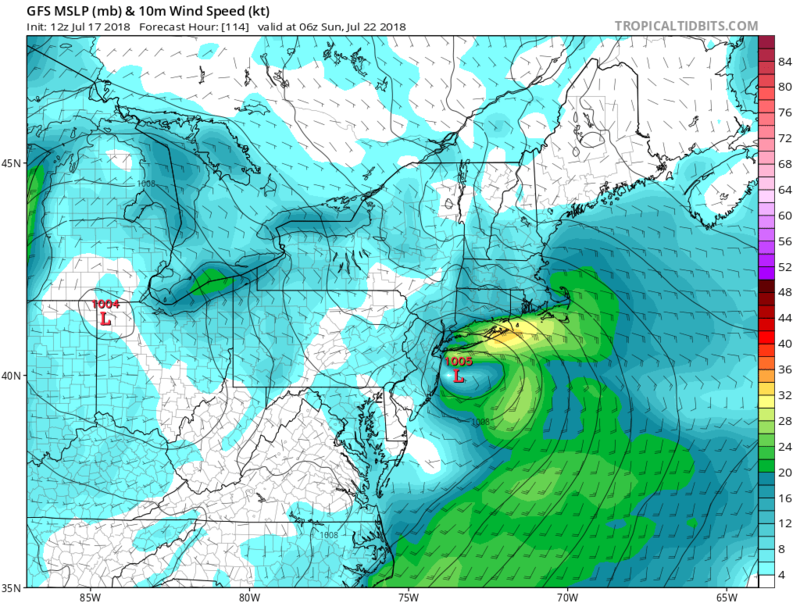 This weekends system will likely be nothing more than a summer Nor Easter type conditions. The eastern side of the LP center could experience gale force winds and maybe the rare stronger gusts, but as of now Im not too sure about anything worse than that. Jon I think we should keep discussion in here for now unless this becomes a named storm which it likely will not. 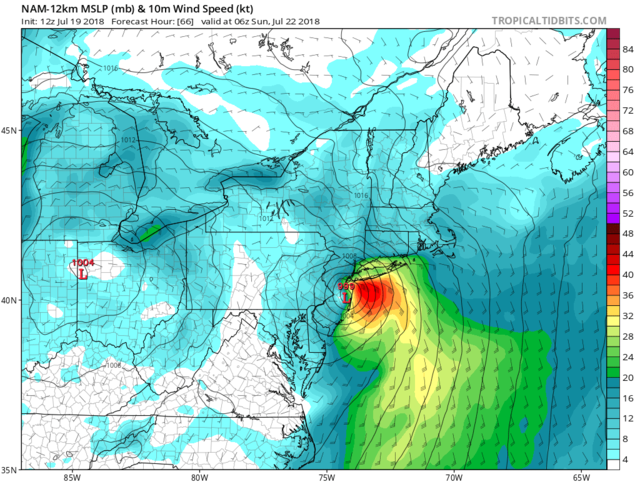 sroc4 wrote: This weekends system will likely be nothing more than a summer Nor Easter type conditions. The eastern side of the LP center could experience gale force winds and maybe the rare stronger gusts, but as of now Im not too sure about anything worse than that. Jon I think we should keep discussion in here for now unless this becomes a named storm which it likely will not. One thing I will say when looking at the NAM and RGEM, ie: short range hi res models, is they may be hinting at a more dynamic system. It still wont change the big picture idea, but like we saw all winter some of the more dynamic systems needed to be in close for the sr models to see the true details of the system. We shall see. Weather will still be unsettled most if not all of next week up and down the EC. While not every location will see rain every day, there will be chances of rain almost every day next week. With a moist unsettled airmass in place any trigger will incite the threat of rain and or thunder storms. 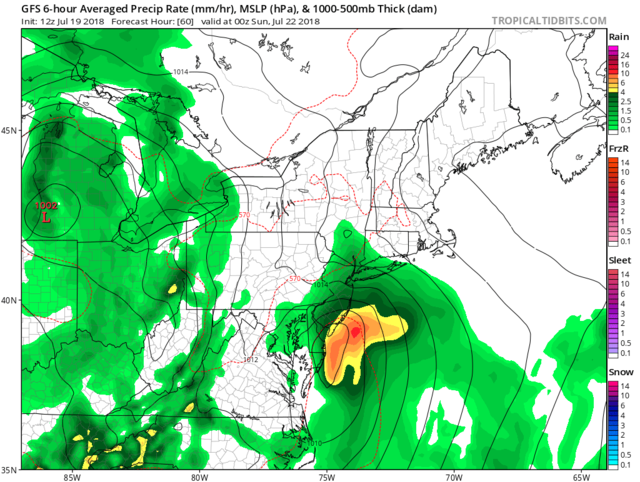 sroc4 wrote: One thing I will say when looking at the NAM and RGEM, ie: short range hi res models, is they may be hinting at a more dynamic system. It still wont change the big picture idea, but like we saw all winter some of the more dynamic systems needed to be in close for the sr models to see the true details of the system. We shall see. Weather will still be unsettled most if not all of next week up and down the EC. While not every location will see rain every day, there will be chances of rain almost every day next week. With a moist unsettled airmass in place any trigger will incite the threat of rain and or thunder storms. If we get a nhc spot marked on the off chance put that here? How's everyone summer been so far? Frank_Wx wrote: How's everyone summer been so far? 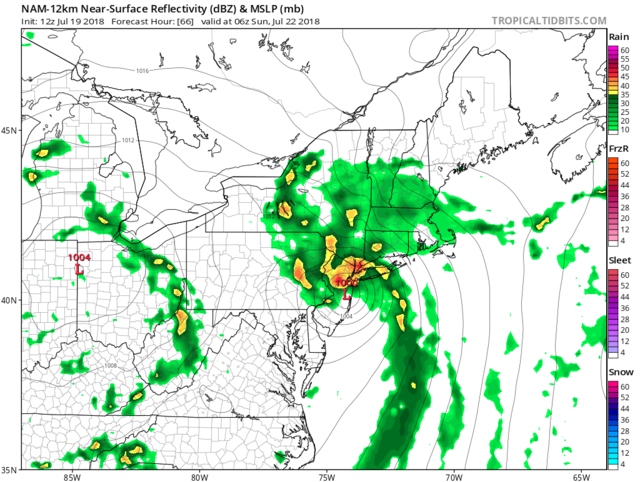 18z 3KM nam creams PA with tons of rain NYC surrounding areas and east see almost nothing. 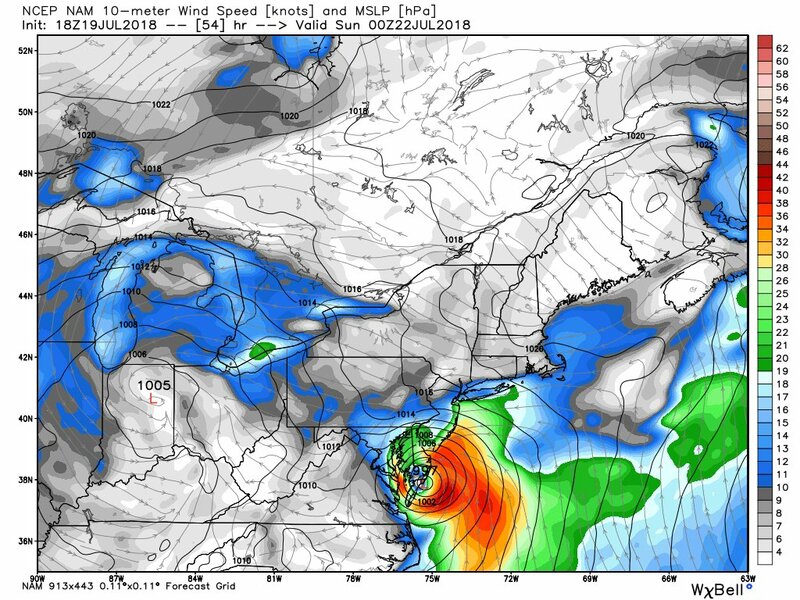 Gores right up the Chesapeake like a magnet to the little water there is, 850mb winds are pretty impressive for a weak system too showing some areas with 64kt winds (yes I know this is not surface). It stays well west pretty much over land. 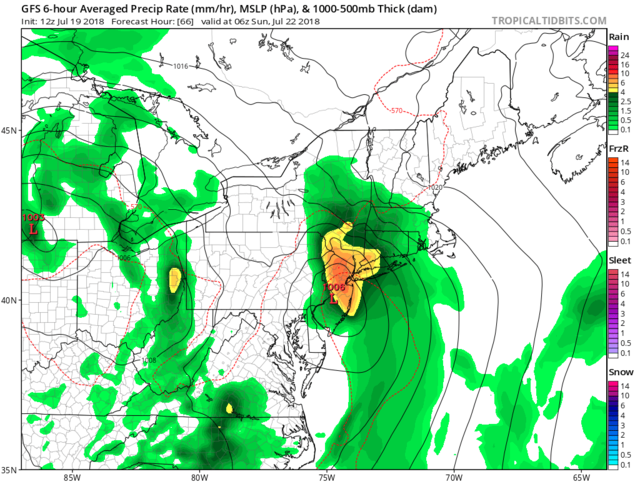 GFS has it a bit more over the water giving a heavy strip of 2-3 inches of rain for CT. Recent posts from JB, he seems to feel it will be TS conditions puts it at 70%, probably no name. There is our storm building over the SE coast in the distance as﻿﻿﻿ I sit on the beach in Myrtle Beach, SC flying in manana. amugs wrote: There is our storm building over the SE coast in the distance as﻿﻿﻿ I sit on the beach in Myrtle Beach, SC flying in manana. jmanley32 wrote: Recent posts from JB, he seems to feel it will be TS conditions puts it at 70%, probably no name. You getting giggidy?? I am. Its prob not going to quite live up to the hype for most but it's something fun to track. Yeah, kinda, its not going to be a epic storm by any means probably. Still interesting to track and I love seeing that spin form even if it is just a LP. you know your a weather geek if you considering canceling your plans to see Jeff Dunham (no charge they are free tickets) and a comped Sat at the casino in CT to be able to watch the weather LOL, eastern CT might actually get buffeted pretty good though so maybe i should go and go down to New London at night if anythings going on, I dunno. Ahh the decisions of a weather nut. But it appears to def be timed around late sat night into sunday then lingering rains all week as frank said. barring any major changes of course. Maybe it stalls grows to a Cat 5 offshore of NYC and never moves anywhere, that would be terrible. 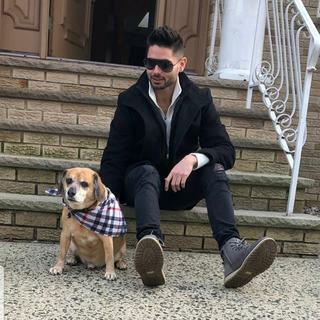 How do you know maybe that could is something else, who made you mr know it all LOL, JK looks nice. sroc, being its likely not going to be a tropical system, do you see the NHC putting up a spot? I would have thought by now they would, but the 5 day is clear so I am guessing they are considiering it like most a nor easter like system. But it certainly looks on the models like a tropical LP. OY, we have our carnival next week, Tues- Sat. Hopefully the rain will come during the day leaving nights clear for zeppoles and rides!